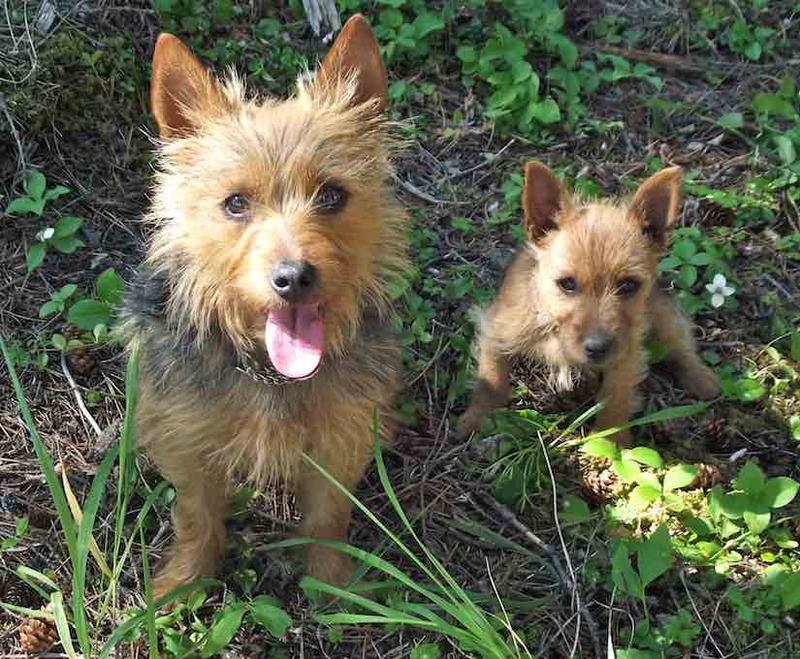 Norwich Terrier is the working terrier of East Anglia. 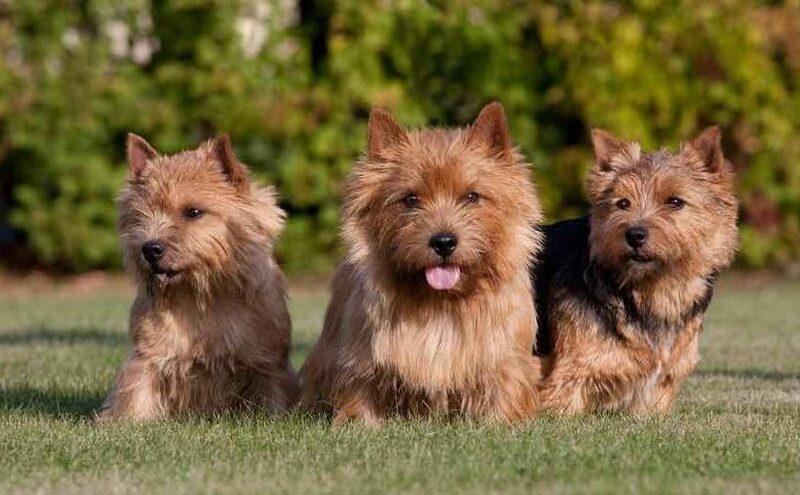 Dog fanciers developed the Norwich by crossing small Irish Terriers with other short-legged terrier breeds. Once known as ‘Cantab Terriers,’ the game and hardy little dogs were useful on the hunt, in the stableyard and as a fun-loving family pet. 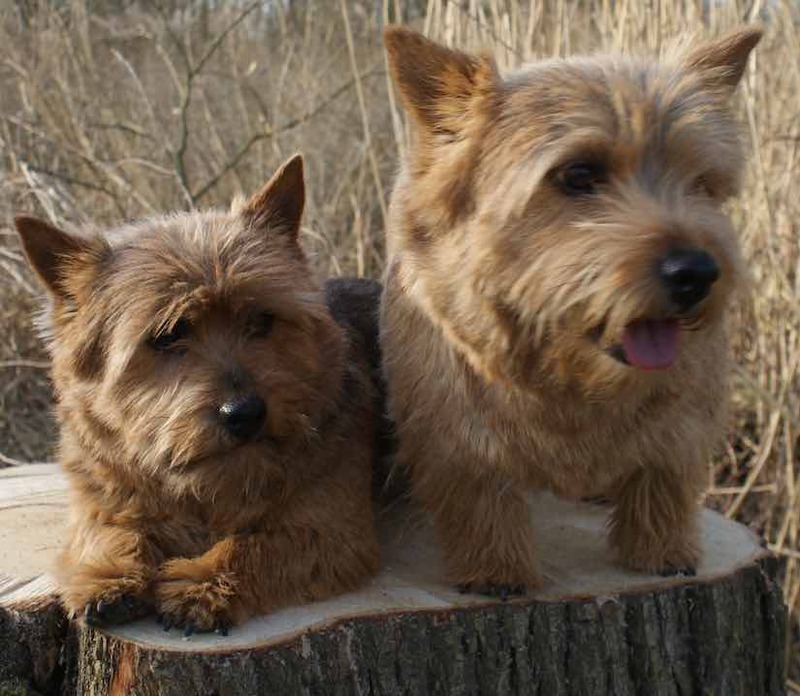 There was not a lot of uniformity in the breed until 1923 when the breed became known as the Norwich Terrier and a breed standard was accepted by The Kennel Club (England). 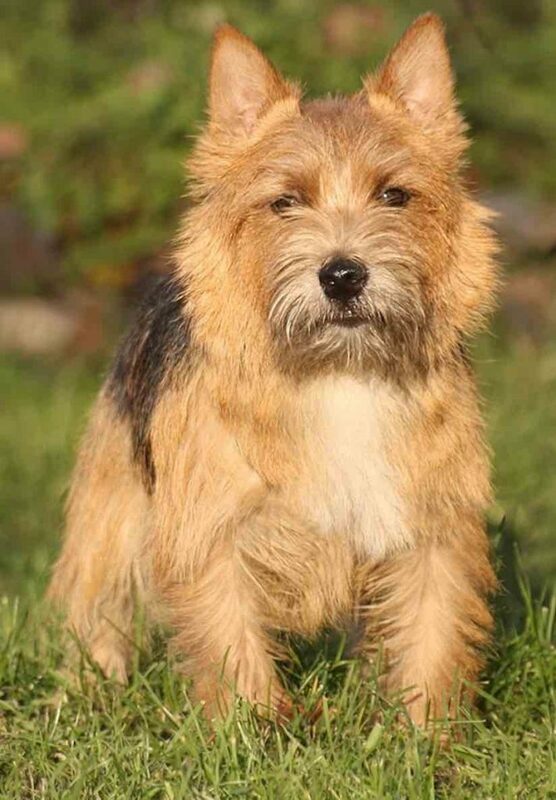 The Norwich Terrier name covered both the drop-eared and prick-eared varieties until 1963 when the drop-eared dogs were reclassified as Norfolk Terriers and the prick-eared dogs retained the name of Norwich Terriers. Gay and fearless little teddy bears, the Norwich has a pert personality that endears it to its owners. 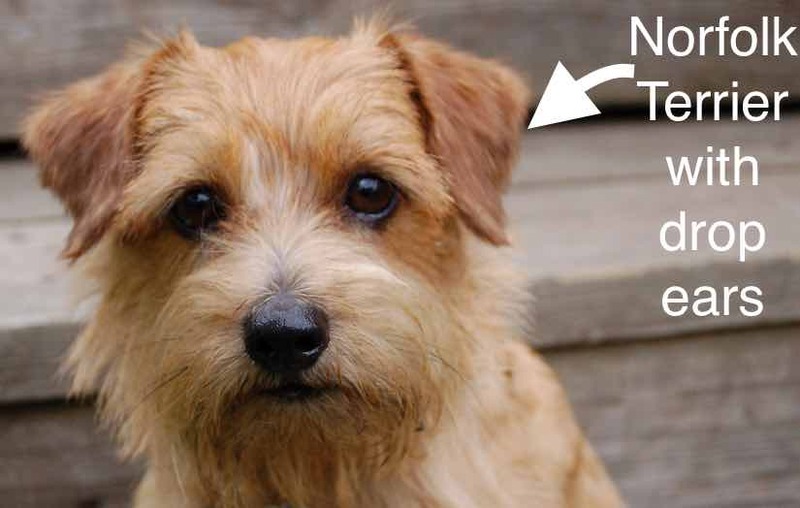 General Appearance: The Norwich Terrier is one of the smallest of the terriers. Of a lovable disposition, not quarrelsome, tremendously active and with a hardy constitution. A small, low, keen dog, compact and strong with good substance and bone. Honorable scars from fair wear-and-tear should not be penalized unduly. Ideal height 10 inches (25 cm) at withers. This ideal height should not be attained by excessive length of the leg. Coat and Colour: Coat hard, wiry, and straight, lying close to the body with a thick undercoat. Longer and rougher on the neck, forming a ruff to frame the face. Hair on head and ears short and smooth, except for slight whiskers and eyebrows. 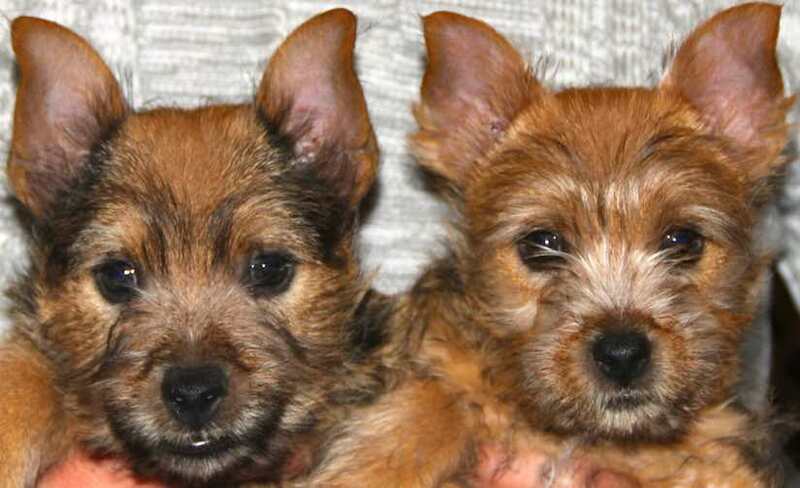 Color all shades of red, wheaten, black-and-tan, or grizzle. White marks or patches are undesirable. Head: Skull wide, good width between the ears, and slightly rounded. Muzzle: wedge-shaped and strong, length about one-third less than a measurement from the occiput to the bottom of the well defined stop. Mouth: tight-lipped, jaws clean and strong. Teeth strong, rather large. Scissors bite. Eyes small and oval shaped, dark, full of expression, bright and keen. Ears are erect, set well apart on top of the skull. Of medium size with pointed tips. Held perfectly erect when aroused and laid back when not at attention. Neck: Strong, of a good length, commensurate with correct overall balance, flowing into shoulders. Forequarters: Shoulders well laid back. Legs short, powerful and straight; elbows close to the body. Pasterns firm and upright. Body: Level topline. Short back, compact body with good depth. Long and well-sprung rib cage with a short loin. Hindquarters: Well developed, Legs very muscular. Hocks of moderate angulation. Dewclaws undesirable; if present, they must not obstruct gait. Feet broad, with strong toes, moderately closed, and with rather high knuckles. The so-called dewclaws which sometimes occur on the inside of the hind legs are imperfectly developed toes. They are of no use to the dog and are not taken into consideration in judging. Tail: Medium docked. Set on high to complete a perfectly level topline. Carried erect. Gait: Forelegs should be moving straight forward when traveling. Hind legs should follow in the track of the forelegs when moving, making the pads and with the hocks parallel. Faults: Consider any departure from the foregoing points as a fault and the seriousness of the fault will be in exact proportion to its degree.